At the beginning of Kendrick Lamar’s new video for “element.,” a single dark-skinned hand rises, open-palmed, from blue water. For a moment, it recalls the final frames of Beyoncé’s “Formation” video, in which she sinks into the C.G.I. New Orleans floodwaters while lying atop a police car and then, immediately after, in another scene, twirls her hand as she sits primly on a living-room chair. But, as many Web sites, blogs, and Twitter users have pointed out, Lamar’s video—directed by him, his manager and childhood friend Dave Free, and the German photographer Jonas Lindstroem—draws directly from the work of the photojournalist Gordon Parks. 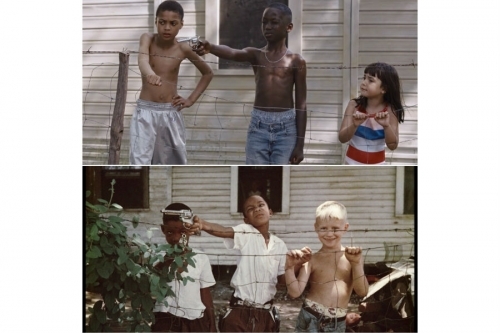 Several scenes in the video mimic Parks’s photographs from the fifties and sixties: a black boy aiming a toy gun as he stands at a fence with two companions, one also black, the other white; a row of what appears to be black nuns dressed in white (Parks’s photograph actually features the daughter of Elijah Muhammad, an early leader of the Nation of Islam, the radical black Muslim group); a boy balancing a June bug on his forehead with a string; and a group of Nation of Islam members practicing self-defense. The appropriation of Parks, as well as the choice to collaborate with Lindstroem, who is known for his spare, bold, textural fashion photography, signals a slight shift for Lamar, whose music videos have become more conceptual and imaginative since he released his last album, “To Pimp a Butterfly,” in 2015. In videos for “Alright,” “For Free?,” and the recent “humble.,” music-video conventions are dressed up with exciting scenarios. The videos have distinctive styles, but the aesthetics are fairly surface-level. In “element.,” blackness, or the dynamic presence of black bodies and the lives that inhabit them, is reimagined not only lyrically and narratively but also visually. The video’s aesthetics are not additional but, rather, essential to the action within and significance of each scene. And, though many of the images in “element.” are borrowed, the way they are brought to life feels new. The editing and cinematography seem to imitate memory, in that the snapshots contain actions and visions at once fleeting and everlasting. The mimicry of iconic photography is not unheard of in music videos, particularly in those that seek to represent blackness. Janet Jackson’s 1997 video for “Got ’Til It’s Gone” (a song that, impressively, both samples Joni Mitchell and features Q-Tip intoning the unforgettable refrain “Joni Mitchell never lies”) includes reënactments of the work of the Malian photographer Malick Sidibé, who died last year. The video was directed by the white American filmmaker Mark Romanek, who said that he wanted to incorporate “African photography” into an anti-apartheid theme—at the end of the video, a liquor bottle smashes into a “whites only” sign. Of course, apartheid was in South Africa, not Mali, and Sidibé’s photographs actually depicted the limited social outings of young people in a conservative, constrictive West African society. But the video’s power is in its attention to the immediacy of experience—of pleasure, pain, and celebration, of and by black people. In one scene, a lanky, obsidian-skinned woman hides elegantly behind an antique film camera before revealing herself to be the famous Sudanese model Alek Wek. The videos for both “element.” and “Got ’Til It’s Gone” embrace an archival impulse while moving beyond it. Parks and Sidibé are integral to each video’s aesthetics, but the music-video form privileges, above all, sound and movement. Particularly in the case of Parks, the videos transform historical records into lived sensations. And, in certain scenes in Lamar’s video, not borrowed from Parks, I was reminded of the contemporary photographer Deana Lawson, who was featured in this year’s Whitney Biennial. Lawson’s work draws on, broadly speaking, both European and African portraiture, but in decidedly black American and Caribbean settings. “Binky & Tony Forever,” her photograph of a couple in a densely colored bedroom holding each other as the woman looks seductively at the camera, was the cover image for Blood Orange’s most recent album, “Freetown Sound.” In “element.,” several scenes of groups of black men shirtless, flexing, wilding, hooting, and hollering recall Lawson’s “Signs,” a staged image in which a group of shirtless, tattooed black men throw up gang signs while staring down the camera. Another scene from the video shows a black couple in bed, with thick, warm browns and yellows bathing their skin, Lamar’s Binky and Tony. Representation is a tricky game, and photography, which isn’t simply a freeze-frame or recorded moment but an entire reassertion of presence, can sometimes sag under the weight of culture, history, and identity. Parks’s, Sidibé’s, and Lawson’s photographs succeed where their subjects, candid or posed, maintain an active and even elusive presence, not because of or despite their backgrounds but in concert with them. With “element.,” Lamar, Free, and Lindstroem double down on this quality of the best photographs—they develop an expressive and substantive visual language that applies the rapper’s nimble mastery of lyric and rhyme to the complex, challenging imagery that his words profess.